Nurse Lucie found the small country clinic at Guale Farms a paradise. But the two men she fell in love with complicated that paradise. Nurse Lucie Hatcher walked head-long into another world when she arrived at the small Georgia clinic at Guale Farms, eager to work with the skilled Dr. Wesley Warren. Lucie didn’t plan to get involved with the handsome young doctor, nor with the rich owner of the experimental farms, Perry Latham. But she did…with both. That’s an unfortunate bit of paper loss on the front cover. Not because it obscures the handsome doctor’s face, but because I wish it were 1/4″ lower so he’d look like he had Rip Taylor’s mustache. 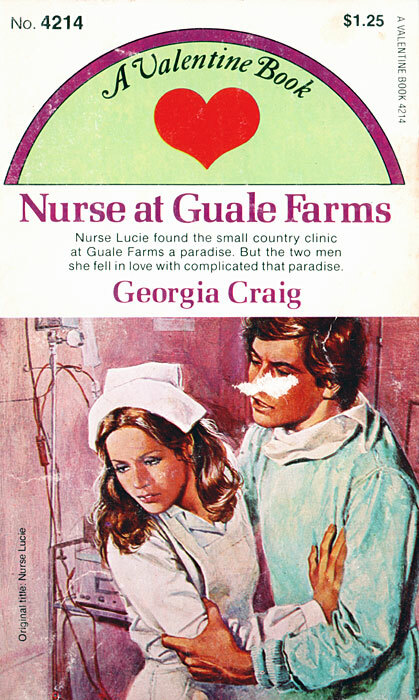 This is actually a Valentine reprint of Nurse Lucie , but I much prefer almost everything about the original: the title, the jacket blurb, the cover illustration, and (especially) the title font.